In the sciences, the “tools” for measuring the volumes of liquids are generally made from glass, plastic or occasionally metal, although professionals referred to all of them as “glassware.” Scientists, and chemists in particular, have a variety of glassware at their disposal for measuring volumes. The particular piece of glassware chosen in any situation will depend primarily upon two factors: the required volume and the accuracy required for the measurement. Chemists use beakers, flasks, burets and pipets to measure the volume of liquids. 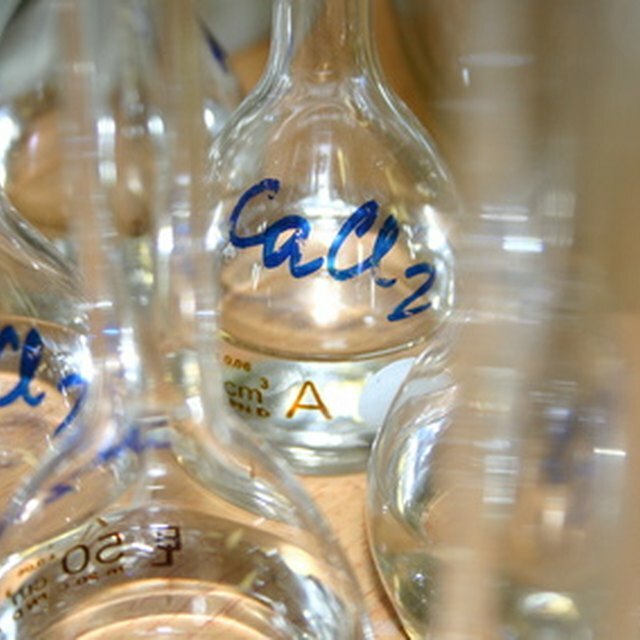 Beakers and Erlenmeyer flasks can be used to make coarse measurements of volumes, provided that graduated volume levels are printed on the side of the beaker or flask (not all beakers and flasks have these marks). They are usually accurate to within 5%. The volumetric flask, designed for greater precision, is typically accurate to within 0.05%. Its uses include the preparation of solutions of known concentration. Graduated cylinders are transparent cylinders with finely divided markings – otherwise known as graduations – marked on their side. They represent a significant improvement in accuracy over beakers and flasks – generally to within 1%. Thus, a 10 mL graduated cylinder will be accurate to within 0.1 mL. Graduated cylinders are manufactured in sizes ranging from 5 mL to 2000 mL. As with beakers and flasks, graduated cylinders are available in either glass or plastic; glass is easier to clean, but more fragile and expensive than plastic. To a scientist, a large difference exists between a volume of 25 milliliters (mL) and 25.00 mL. The first quantity only requires a precision of 0.5 mL; that is, the measuring device only needs to be able to measure an actual volume that’s within a few tenths of 1 mL. Measuring 25.00 mL, however, requires a device capable of measuring to within a few one-hundredths of a milliliter. Glassware with such accuracy is categorized as “volumetric” glassware. Burets fall into this category. Burets are also cylindrical pieces of glassware with graduations painted on the side, but they have a valve at the bottom (called a “stopcock”) that allows the liquid to flow out the bottom. They are typically accurate to within 0.01 mL. Burets are available in sizes from 10 mL to 100 mL, although 50 mL is the most common size. Pipets are slender tubes, typically 12 to 24 inches long. They may measure a predetermined volume such as 25.00 mL or 10.00 mL. They may also have graduations (these are called “Mohr” pipets) that allow odd and fractional volumes to be delivered. They are generally accurate to within 0.02 mL and are thus classified as volumetric glassware. When you squeeze the rubber bulb on the pipet, the suction from the expanding bulb draws liquid into the pipet. The operating principle is much the same as sucking liquid through a straw, but without the hazard of requiring mouth-to-glassware contact, which is strictly prohibited in laboratories. Some pipets are single-use devices made of disposable plastic. Brubaker, Jack. "Tools Used to Measure the Volume of a Liquid." Sciencing, https://sciencing.com/tools-used-measure-volume-liquid-7221466.html. 29 April 2018.